My time in Paris was spent lovingly admiring art. One of my afternoons there was spent entirely in bliss at the Musée Rodin, which houses thousands of sculptures by Auguste Rodin and his mistress Camille Claudin. His most famous works, The Kiss and The Thinker are on display here in Paris at the Hôtel Biron, while the rest of his art is at the Villa des Brillants in Meudon. I knew The Thinker, but not much about the man or the rest of his art. I am particularly fond of sculpture, so this museum was a natural fit for me. This day was one of the warmest while I was in Paris in March, and the sun was shining brightly, creating such wonderful patches of light and darkness. 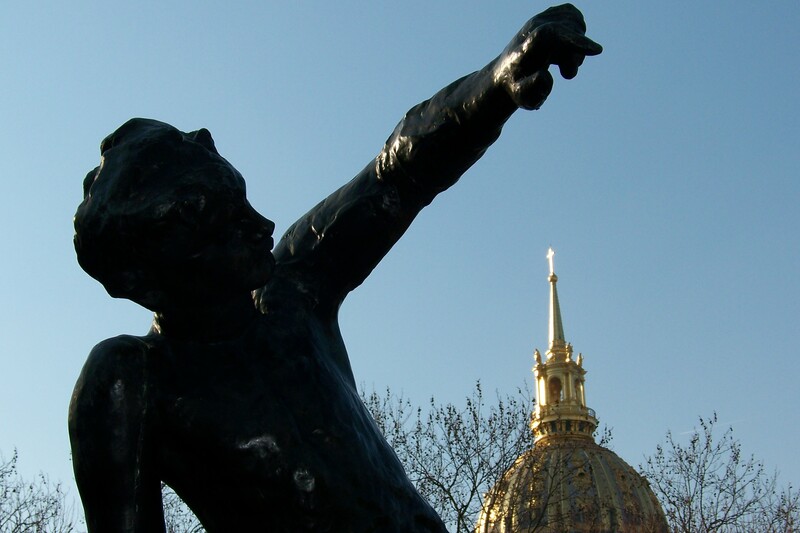 This photo shows all of that, and when I looked up at this sculpture, his torso and arm were creating such a space with the dome of Napoleon’s tomb, which was also reflecting the sunshine. This entry was posted in Europe, Photos, Wednesday photo and tagged Art, Paris, Photos, Travel. Bookmark the permalink.